Lighting experts at Philips and office furniture designers at Haworth have put their heads together and come up with a bright idea for combining their products. Since lighting is a key feature that lift employees’ moods, it’s important to ensure the workplace is well lit. However, quality is just as critical as quantity. Natural daylight is best while flickering, oddly tinted fluorescent lights that make everyone’s skin look chalky green are arguably the worst. LED lighting comes the closest to mimicking sunlight. In fact, LEDs can be created in literally dozens of different subtle gradations of “white” as well as hundreds of other colors. In addition, unlike filament based incandescent bulbs and tube based fluorescent lamps, LEDs can be delivered along a much more diffuse surface. Haworth and Philips are leveraging these features of LED to create the ideal workplace lighting solutions that combine furniture and illumination. 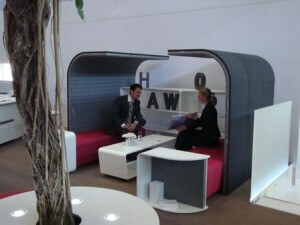 Haworth already features Philips lighting in the MeetYou lounge furniture series. Now, the companies are collaborating on more innovative ideas. One forward-looking design is the lighted divider concept. Imagine a workplace where light is used to define boundaries. Instead of creating dark nooks and crannies, these gently glowing screens would make the workplace appear more bright and open – even as they provided necessary separation. We like the idea of incorporating light into dividers. This could be done with floor-to-ceiling walls, head height privacy screens used to delineate teaming areas, and even in desktop dividers where the LEDs could provide task lighting. So far, Haworth and Philips are just debuting their LED office furniture ideas in Europe. But we think you could achieve something similar by attaching a clamp-on LED task lamp to one of our cubicle panel extenders or desktop dividers. That way, employees can get all the light they need even with higher cubicle walls that provide more privacy. Should You Host BYOB Day at Work?